At the race track, it doesn’t take much to tell competitors apart in the crowds. Just look for the sponsor-laden—hopefully, in the driver’s case—fire suit, and you’ve found your person. But, back in the early days, competitors simply wore their street clothes—and they were at a much higher risk because of it. Happy Sunday! 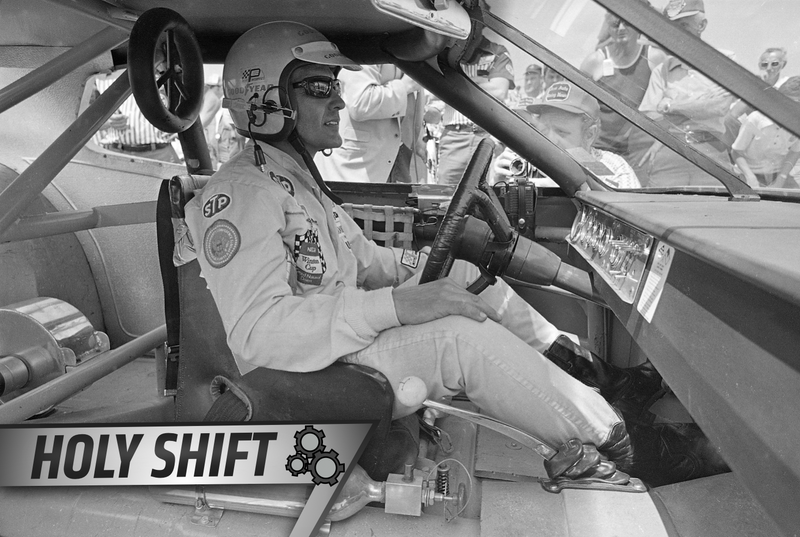 Welcome to Holy Shift, where we highlight big innovations in the auto and racing industries each week—whether they be necessary or simply for comfort—and, on occasion, weird car history. In fact, it wasn’t until midway through the 1960s that fire-resistant suits, now a basic safety standard, truly entered the sport of auto racing. On the NASCAR side of things, drivers through the 1950s wore T-shirts and jeans to go out and race. While that sounds about as American as can be, it was equally unsafe. Perhaps the most comprehensive history of fire suits comes from NASCAR.com, which cites driver Tim Flock as one of the first racers to don an early version of a fire suit in the 1950s—it just didn’t have the “fire” part of the equation down. It was a thin uniform, but it broke the pattern of casual wear behind the wheel. According to the website, drivers caught on during the next decade. Some began to dip the uniforms in baking soda in attempts to add some fire resistance, and the introduction of cooling liner—which exists for just what the name suggests, keeping drivers cool via an air hose—made its way into suits as well. The advent of true fire suits came in the years following Fireball Roberts’ death in 1964, per NASCAR.com. Roberts survived a wreck in the World 600 at Charlotte Motor Speedway in which his car caught fire, but died from complications with the burn injuries about six weeks after. The first fire suit made by Simpson Race Products came out that year, and Nomex, a fire-resistant material still used in fire suits, was available by 1967. Meanwhile, in Formula One and other FIA-sanctioned racing bodies, the drivers wore layers upon layers of clothing to keep fire away. Per the F1 website, the FIA made fire-resistant clothing mandatory in 1975. The beginnings of F1 fire suits were the opposite of the modern version, though—heavy as could be. Drivers might have been safe from fire, but at the cost of wearing five layers in a NASA-spec race suit. Luckily for the F1 drivers, their suits lightened up throughout the last four decades without losing the ability to keep fire away. The modern Nomex suits in F1 can last up to 11 seconds in 1,544 degrees Fahrenheit, according to the series’ website. The suits also have a piece of material on each shoulder able to act as a handle for removing a driver from the car, and they must be able to support the weight of a driver and the seat. In a trend that started as a way to differentiate from wearing street clothes in the race car, the racing suit certainly came a long way—along with plenty of other safety innovations in motorsports, like the HANS device and soft walls. The sport will always have calls for more safety regulations in place, but just remember how far it’s come. If you have suggestions for future innovations or historical notes to be featured on Holy Shift—in street cars, the racing industry or whatever you’d like—feel free to send an email to the address below or leave them in the comments section. The topic range is broad, so don’t hesitate with your ideas.